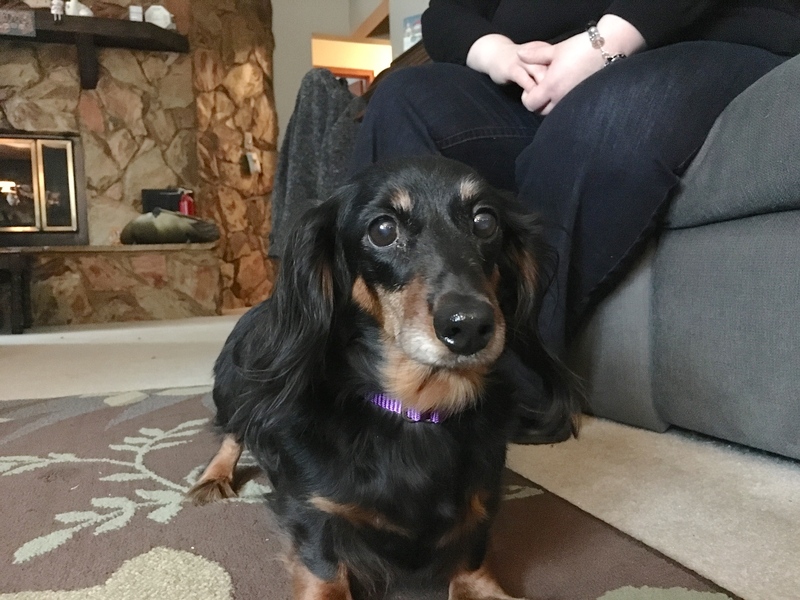 ZaHara is a nine-year-old Long hair Dachshund adopted through Little White Dog Rescue in October of last year. She was abused in her former home and is now fearful and despondent; shutting down and sitting in her bed all day. Whenever you’re working with a dog who comes from an abused background, it’s important to move slowly, literally and figuratively. Dogs who have been abused are easily spooked and startled. As a result it’s always best to move in slow, fluid movements and make a sound to get the dogs attention before you change positions. This way you avoid catching the dog off guard which can be particularly unsettling for an abused dog. I wanted to make sure that ZaHara was comfortable with my presence before I started working with her so I adopted a very slow introduction. It’s often a heartbreaking for humans to see a dog shutter and shake due it coming from an abusive background. Our natural instinct as humans is to scoop the dog up so we can hug and console it to let it know that it is in a safe place. While this psychology works well on humans, it can actually have the inverse effect on dogs. I spent the next few moments discussing how ZaHara’s guardians can best interact with her at this stage. It’s going to be difficult for ZaHara’s guardians to make these small changes in how they interact with her, but this will be an important step in the dog’s rehabilitation process. I continued working with the dog intermittently, using the leash to motivate her to move slowly outside of the little cubby that she had sequestered herself in after she first arrived her new home. I always like to incorporate scent when working with a dog, especially those that are shut down due to an abusive past. As such, I slowly extended my hand towards the dog with my palm towards the floor a few times to give her an opportunity to give me a sniff. The dog pressing her snout up against the back of my hand this way may seem like a small thing, but it was really a big step. It’s possible that this was the dog’s attempts to communicate to me that even though she was wary or fearful of strangers, she needed help. Now that Zahara had initiated contact with me, I knew she was ready to take the next step. We moved down to the living room and once there I used the leash to block ZaHara from running away. I wanted to help her start to practice being in the same room with some humans. In Zahara’s case, I knew that a big part of her rehabilitation would be to simply be in a room with humans who were not trying to touch, talk to or interact with her. All I was asking of the dog at this point was to simply be with us. I discussed the leash technique with her guardians for several minutes while I gave the dog and opportunity to get used to being in the room with us this way. Once the dog relaxed a bit, I pulled out some high-value treats so that I could try to engage her nose. While I was able to get Zahara to use her nose a little bit, it was a very small step. 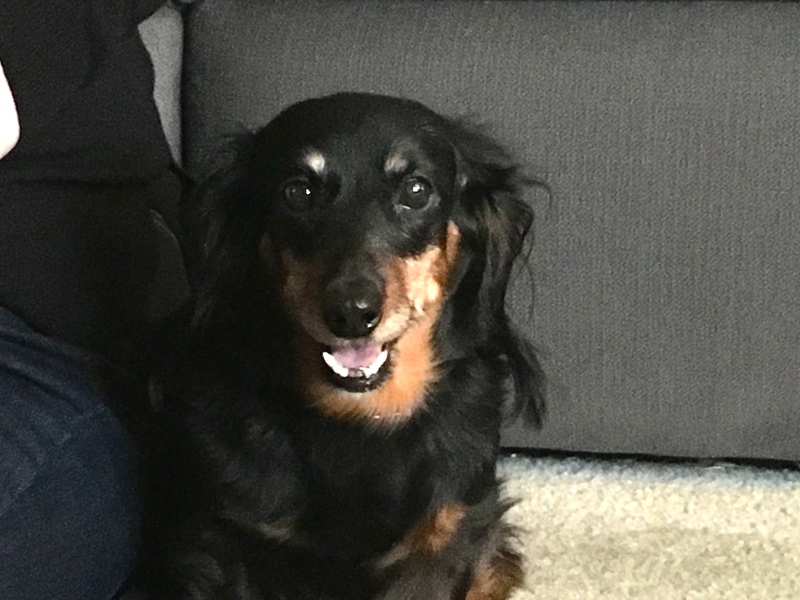 Because dogs get over things by literally moving forward, I spent the next few minutes discussing how we could use a simple walk to help Zohar learn to regain some of her self-esteem. Now that I had explained the architecture of this part of the rehabilitation process with her guardians, I was ready to take Zahara on a short walk around the living room. I wanted to apply as little tension or pulling on the leash as possible. My goal was to motivate the dog to move forward through a rocking motion of gently pulling the leash until she started to move forward, then immediately relaxing it. At first, I had to apply more pressure on the leash then I would’ve preferred, but within a handful of tugs the dog started to move forward on her own! Unfortunately this wave of success was short-lived. Zahara started to really pull back against the leash after several feet. When I applied the gentle tugging motion to the leash again, I noticed that it appeared as though the collar may slip off her neck. I wanted to make sure that the leash didn’t pop off the dog as this most assuredly would send ZaHara running back to her sanctuary in the corner of the other room. To overcome this issue I pulled out a Martingale collar, slid it over her head then applied the special twist of the leash. Now that I knew the dog could not slip off of the leash, I took her for another walk around the living room. Through a combination of the new Martingale collar and the practice walk we had just run through moments earlier, ZaHara was much more willing to move forward on this walk. I advised ZaHara’s guardians to walk her in a similar fashion every single day. At first they should walk around the perimeter of the room as the walls will provide the dog with a feeling of comfort as she will see it as cover. But as the dog’s comfort level sets in, it will be important for the guardians to start introducing new variables to the walk; walking in a different direction, changing patterns and exploring new parts of the house. The idea is to gradually increase the distance and duration of the walk so that the dog can absorb it in small chunks. As the dog gains experience from these walks, her confidence and self-esteem should increase. Earlier in the session, the guardians had mentioned that at times they have to reach in and pick up the dog. While this is no big deal for most dogs, a head first approach this way can be quite unnerving for a dog that is fearful. I spent the next few minutes discussing a better way of approaching the dog that will help her feel more comfortable and less threatened. Because height is a big factor for dogs, I suggested that her guardian take a seat on the floor to be at the dog’s level. Once the guardian was on the floor, I passed her the leash and had her sit on it about a foot and a half away from where it attached to the dog’s collar. The guardian had a nice calm and relaxed energy to her which was perfect for the situation. As we sat on the floor and discussed the situation, I noticed ZaHara relaxing; her body posture wasn’t so hunched over, her pupils were less dilated, the shaking had stopped and she was taking in her surroundings rather than simply looking down in one place. These were all really good signs of progress, but a couple of minutes later ZaHara showed us that she was feeling more comfortable by seeking out contact with her guardian; something she had not done since they brought her into their home. This was the second time in the session that the dog had sought out contact with a human. Now this wasn’t a dog running over to jump up or into the lap of someone as most people are accustomed to. But in this situation, the small moves forward towards human contact were hugely significant. As we sat on the floor and discussed these breakthroughs, ZaHara relaxed even more. Not only did the dog completely lay down multiple times (which is big), I could see the anxiety draining away from her. While it breaks my heart to know that any dog was abused, it is very rewarding for me to be called in to help a dog that comes from that sort of background. Seeing ZaHara start to regain her confidence and move forward to initiate contact with humans let me know I had done a real service for this family. You could see a light in her eyes by the end of the session and that made my day. It’s going to be incumbent upon her guardians to move slowly and methodically. They will need to help guide the dog forward in a very gradual manner. Gently pushing her forward yet backing off and supporting her when she hits her limits. By taking their time, rewarding progress and approaching the dog in ways that help her feel comfortable, they will help ZaHara regain her confidence and self-esteem. This process will take time, but based on how much progress we made in the last few hours, Im optimistic that ZaHara can make a full and complete recovery.